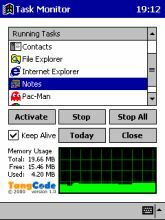 If you are tired of having to go into "Settings", "System", "Memory" and then select "Running Programs" to stop and activate tasks, consider using TangCode Task Monitor to manage your tasks instead. It is specially written to be used through a hardware button for even quicker results. The program is similar to the Task Manager that appears when you press Ctrl-Alt-Del in Windows NT. 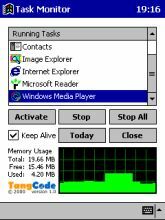 The program displays your memory status and also shows memory usage in a graph. The program automatically closes itself down when you work with other programs. You can, however, select "Keep Alive" to allow the program to continue monitoring memory usage in the background for the graph. When you start the program, the most recently active program would be automatically selected in the list of tasks. You can activate a selected task by (1) tapping the Activate button below the task list, (2) by double-tapping the task or (3) pressing your hardware Action/Enter button. Task Monitor will close itself automatically if you (1) activate a program, (2) start another program from the start menu or (3) use the Today button to go to the Today screen. You can disable this action by checking the Keep Alive box. The Close button always closes Task Monitor. The Stop button stops a selected task. You can stop all tasks by tapping the Stop All button. If you assign hardware Button X to launch Task Monitor, pressing Button X again would stop a selected task. So by pressing Button X twice in a row you can shut down the last active program. If there were no tasks selected, pressing Button X again would take you to the Today screen. This means, if you hold down Button X, you can (1) launch Task Monitor, (2) close all tasks (including Task Monitor) and finally (3) end up with the Today screen. Extensive testing has only been done on the Casio Cassiopeia E-115. Report any problems to support@tangcode.co.uk. Fill in the form below to get the Code Word for Image Explorer.